I have seen many reviews done on other blogs of Plow & Hearth products. They sell everything from outdoor furniture to bedding to shoes. I love all of the outdoor items which are so fun for summer. 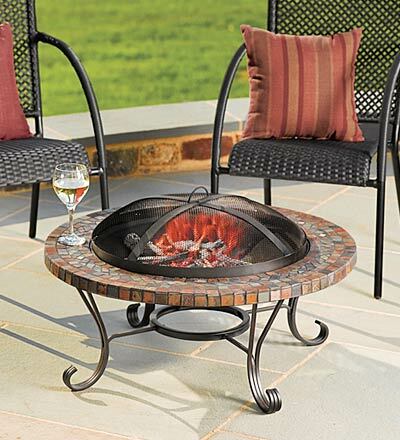 I really want the firepit pictured below. The company also sells cool outdoor lighting that I am interested in. It was hard to choose an item to review but since I needed some flat shoes that I could wear to work, I chose the Privo by Clarks Polar Lake Shoe in black and pink. These shoes are very comfortable which is what I was going for. The first thing that I noticed when I tried them on is that they have a very thick padding for extra support. They also come in green, orange and rosebud. They retail for $74.95 and seem to be very good quality! I can definitely wear them to work which is great. The giveaway will be for a $50 Plow and Hearth gift certificate. The giveaway is open until Midnight on Tuesday June 14th. Winner will be chosen on Wednesday June 15th using Random.org. The winner will have 48 hours to respond or a new winner will be chosen. Visit the Plow & Hearth website and let me know what you would choose! -Like Plow and Hearth on Facebook (2 entries). -Follow Plow and Hearth on Twitter (2 entries). I would get the lady bug LED light string. So cute! I would buy the Mosaic Gel Firepot. Wow, I LOVE the solar string lights!!!! I followed your blog on Google Friend Connect. I email subscribe to your blog. We love decorating outdoors for July 4th so I would definitely get the Americana Wreath. I've always wanted an outdoor bench. The Lutyens Garden Bench is my favorite. I would love to get the #11269 Cape Cod Birdhouse. I'd choose the Pansy Wreath. I entered the Jollys giveaway. I would probably pick the Picnic organizer as one of the item I might purchase. I would purchase the Stained Glass Solar Post Cap Light, #11274. I would get a copper rain chain. I entered your Jollys Garden Shoes Giveaway! I entered your $25 Lovemode Gift Certificate Giveaway! I would choose the Light Bulb Solar Lights. Hello, Oh wow, I really like the Burnished Bronze Finished Iron Montebello Garden Arbor. I might choose that. Thanks for a great giveaway! I want a fire pit. Thanks for the giveaway. I love the cold drink dispensers! I follow Plow and Hearth on Twitter as Anneliz702. I followmyou on GFC as AnneL. love the solar string lights! I might put it towards the Newport Hardwood Bench/Table. I would probably choose the Mosaic Hummingbird Feeder and refills! if it's for me some kind of shoes, the butterfly boots would come in handy. At the Plow and Hearth website, I really love the Autumn Splendor print by Helen Rundell, #82849. I am a fan of Plow and Hearth on Facebook.